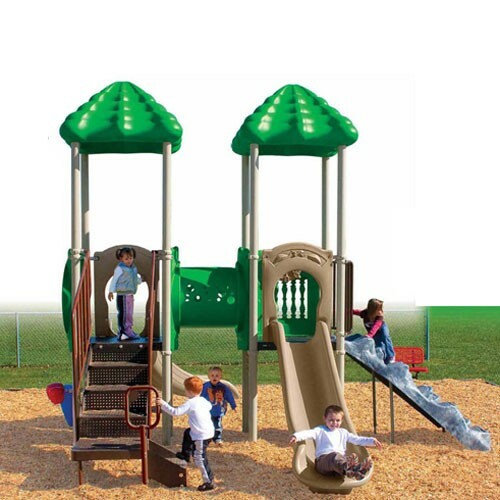 The Signal Spings double deck commercial playground equipment is an ideal mid-size 2-5 play system where space may be a concern and a capacity of 15-20 children is required. With two ways up and two ways down, the Signal Spings offers six accessible above-deck play events. Kids can then take the 4 foot straight or curved slides back down. Above-deck activities include the "Window on the World" lookout panel and the imagination-sparking Ship's Wheel steering panel. The decks are connected by either a Crawl Tunnel or Bone Bridge. Below the decks, kids will love to play the Bobaloo drum and Bongos as well as give the Rain Wheel a spin. The Signal Spings is available in either the Playful or Natural color palettes. Signal Spings meets ADA guidelines and is commercially compliant with ASTM & CSPC. IPEMA certified. The UP & Over features powder-coated steel posts, coated steel decks and rotomolded and blow molded plastic components. The Signal Spings is the perfect easy-install, commercially compliant and budget-conscious solution for day cares, churches and apartment complexes! Assembly required. Truck delivery.